A new study carried out by the UMAS consultancy for environmental association Transport & Environment (T&E) has dubbed the USD 22 billion investment in liquefied natural gas (LNG) infrastructure for shipping in Europe a costly distraction. The EU’s 2014 Alternative Fuels Infrastructure Directive requires member states to build a comprehensive LNG infrastructure across European ports, thus paving the way for a large LNG market. However, the study finds that LNG as marine fuel would deliver, at best, a 6 pct reduction in ship greenhouse gas emissions by 2050 compared to the replaced diesel. The study considers four different scenarios showing a relative GHG emissions abatement ranging from 6 to 10%. 6% corresponds to LNG replacing marine gas oil (MGO), which is expected to become a more expensive fossil liquid fuel. On the other hand, the 10% corresponds to LNG replacing heavy fuel oil (HFO) or low-sulphur heavy fuel oil (LSHFO). These emissions savings would likely be cancelled out by the growth of maritime trade, making decarbonisation of shipping an even more challenging transition for the industry, the findings further indicate. “LNG is not a bridge fuel, it’s an expensive distraction that will make it harder for the EU to achieve its shipping climate goals and reduce gas imports from places like Russia. Europe should back future-proof technologies that would deliver the much greater emissions reductions that will be needed, including port-side charging or liquid hydrogen infrastructure. This means the EU needs to stop mandating LNG infrastructure in European ports,” Faig Abbasov, shipping officer at T&E, said. T&E also mentioned that; to date Europe has spent half a billion US dollars on LNG infrastructure for refuelling ships. 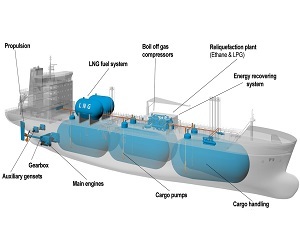 The study concludes that if investments in LNG infrastructure are made now expecting a large LNG market for shipping, but the sector is subsequently required to switch to zero-emission technologies like hydrogen, ammonia and electric propulsion in order to decarbonise, then significant LNG assets (feeders, barges and storage tankers) will likely become stranded by 2050. “There is an uncertain future demand for LNG as a marine fuel over the next 10 years. On the one hand, it is an option for complying with the 2020 sulphur cap, but as it cannot enable the GHG reductions that have been committed to in the IMO’s initial strategy for GHG reduction, and the Paris temperature goals more generally, it is clear its role in shipping’s transition to a low-carbon future can only be transient,” Domagoj Baresic, consultant, UMAS and PhD researcher, UCL Energy Institute, said. In April, the International Maritime Organisation agreed that the international shipping must decarbonise and at least halve its GHG emissions by 2050, but it has not yet set out any measures to achieve this.